Copyright A. Barclay. 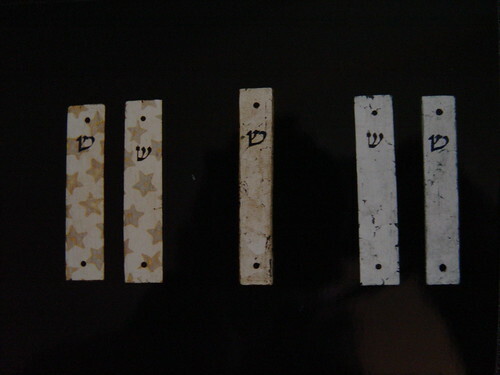 Mezuzah cases hand carved from red & yellow cedar, gold or silver leafed. "It's written that in order that the Torah of Ha-Shem be in your mouth, we drash/explain from this that one does not write Sifrei Torah Tefilin & Mezuzot except on skins of animals & birds that are kosher & the hairs [used in in Tefilin] & the gidin/processed viscera are not kosher unless it comes from these animals. ...& even though it's from the n'veylot/animals which died from being pierced [my note: with an arrow or spear - the modern equivalnet would be a bullet] & not ritually slaughtered, this is a category of animals that wouldn't be kosher to eat but ok for us to use in sofrut. ...& the castrated - these are all kosher not for eating but for the purposes of writing. As long as it doesn't come from anything except the species that are permitted for your mouth, excluding all the tamei/unkosher animals that are not ok to eat. We don't write on the skin of a fish, even if it's a tahor/pure fish, because of the foulness that doesn't cease even when you process it. The skin of a shlil/fetus is considered the best for this purpose & it is the choicest & after this the skin of a fowl & after this the skin of a chayah/beast (or sheep or goats) & a beheymah/domesticated animal (or cattle)...then a neveylah." Lishkat Ha-Sofer confirms that we can only write st"m on the skin of animals which we would be allowed to eat if they were slaughtered - Maseket Shabbat daf Quf"Chet tos' Dalet"Hey is our source. Mishnat Ha-Sofer comments on the Qeset Ha-Sofer's word "veho hamuvhar" in Bet:Alef: The shlil (fetus or embryo of a kosher animal) skin that we use is the best for this purpose because it's never done an aveyra/sinned - in other words, it's a virgin :) - & because it has never seen the light of day it doesn't receive din/judgement. Or ha'of (skin of chicken) in any case you need to look at which side you would write upon, whether on the feather side or the flesh side. In the hierarchy of which skins are preferable, the last in the list is the neveylah - even among all the different kinds of neveylot there is a hierarchy. Technorati tags: religion, Judaism, Torah, Canada, journal, weblog, blog, diary, review, spirituality, art. posted by Soferet | 1:33:00 a.m.